Enter a time of myths and legends. 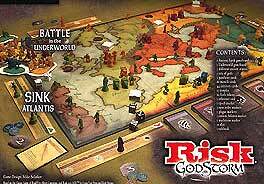 Enter the world of Risk Godstorm, where ancient faiths and fears rule. Battle across the Earth and in the dark regions below. Harness spiritual forces to strike with devastating power. Command five ancient cultures -- Greek, Celtic, Babylonian, Norse, and Egyptian -- in a continent-spanning battle that will determine whse civilization reigns supreme. Rest assured, the gods will not sit idle in this war. Similar to Risk 2210 AD, the Risk Godstorm game lasts for 5 epochs and the player with the most territory at the end is declared the winner!